The United States Football League game in San Antonio on March 24, 1984 featured two teams seeking their first win of the season. The Oakland Invaders and San Antonio Gunslingers were both at 0-4 and struggling to put points on the board. The Gunslingers were one of six expansion teams for the USFL’s second year, and all of the others had recorded at least one win in the early going (two of them were off to 3-1 starts). The club was underfinanced but well coached by Gil Steinke and featured a scrappy defense, although the offense, directed by promising rookie QB Rick Neuheisel (pictured at right), was less impressive. Oakland topped the weak Pacific Division in 1983 but was off to a dreadful start in ’84, having scored a mere 14 points thus far. Head Coach John Ralston was dismissed after three games and Chuck Hutchison, the Director of Player Personnel, was now in command. QB Fred Besana, who performed ably the previous year, was ineffective thus far although he had a standout in WR Gordon Banks for his passes. Like the Gunslingers, the defense was the better unit, but the failure of the offense to generate points was too damaging. There was a small but enthusiastic crowd of 11,012 fans at Alamo Stadium. In the first quarter, the Invaders methodically advanced 65 yards in seven plays that concluded with a pass from Fred Besana to Gordon Banks down the middle for a 19-yard touchdown. Kevin Shea added the extra point for the 7-0 advantage. Good gains on passes by Rick Neuheisel to TE Joey Hackett and WR Danny Buggs moved San Antonio into Oakland territory at the end of the opening period. But the drive finally stalled at the 20 and Nick Mike-Mayer’s 37-yard field goal attempt was blocked. A short punt by the Invaders gave the Gunslingers the ball in good field position. The offense couldn’t move but LB Putt Choate ran 25 yards on a fake punt for a first down at the Oakland 22. 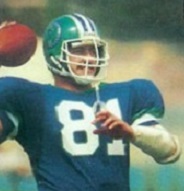 Shortly thereafter, Neuheisel threw to Hackett for a nine-yard TD and Mike-Mayer converted to tie the score. There was no further scoring in the first half as Shea was far off the mark on a 51-yard try for a field goal on the final play before halftime. Oakland moved back into the lead midway through the third quarter on a 36-yard Shea field goal, his first of the season. The Gunslingers had a drive that featured a 32-yard gain thanks to a pass from Neuheisel to Buggs that had 15 yards tacked on to the end due to a roughing-the-passer penalty. RB Scott Stamper ran for 10 yards and San Antonio reached the Oakland 11, but a pass attempt on a fourth-and-one play was batted down. The teams exchanged punts as the game headed into the fourth quarter. With time running down to less than two minutes, the Gunslingers put together an eight-play, 42-yard drive that concluded with RB Al Penn-White punching in for a touchdown from a yard out. Mike-Mayer added the point after to make it a four-point game. The fired-up San Antonio defense then stopped the Invaders in four downs to win by a final score of 14-10. The Gunslingers led in total yards (270 to 201), first downs (17 to 12), and time of possession (34:23 to 25:37). However, Oakland recorded four sacks, to two by the Gunslingers, and San Antonio was penalized eight times, at a cost of 55 yards, to five penalties for 35 yards on the Invaders. There were no turnovers by either club. 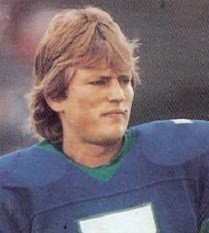 Rick Neuheisel completed 13 of 26 passes for 156 yards with one touchdown. Scott Stamper led San Antonio’s rushers with 46 yards on 17 carries and RB Marcus Bonner and Joey Hackett (pictured at left) were the top receivers with 45 yards on four and three catches, respectively, and Hackett scored a TD. For the Invaders, Fred Besana was successful on 19 of 34 throws for 154 yards and a TD. Gordon Banks caught 6 of those passes for 81 yards and a touchdown. RB Arthur Whittington gained 43 yards on 13 rushing attempts. On defense, LB Randy McClanahan accounted for two sacks. The Gunslingers didn’t immediately build upon their initial victory as they lost twice more before winning three of four games on the way to a 7-11 record that placed third in the Central Division. Oakland’s losing streak reached nine games, and a third head coach, Charlie Sumner, was in charge before the Invaders abruptly turned around and reeled off seven straight wins to move into contention in the still-mediocre Pacific Division. They ultimately fell short and also finished at 7-11.